It was a full house in the FM studios! 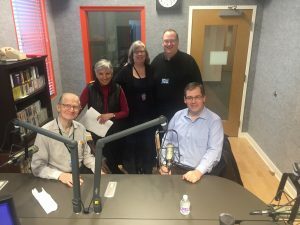 Saturday evening, the Syracuse Friends of Chamber Music will be presenting their Mid-Winter Concert, and Diane Jones welcomed John Oberbrunner and Barbara Haas from the SFCM board, along with Jon Garland, horn, and Jon English, tenor, to learn more. The concert features 3 Bs – but not the ones you may be thinking of! Music of Leonard Bernstein, Benjamin Britten, and Johannes Brahms, presented by an incredibly talented group of Central New York musicians will fill the stage. Visit the Syracuse Friends of Chamber Music website (here) for tickets and more information.